“There’s this idea that everybody drives and that everybody has a car. And we found that that’s really clearly not the case,” said Nancy Smith Lea, Director of the Centre for Active Transportation. The report also found there were many households that didn’t have a motor vehicle at all. Smith Lea says cycling should be a low-cost option for many people without cars, but the lack of infrastructure, knowledge of such skills as bicycle maintenance or motivation may be holding them back. Marvin Macaraig, coordinator of the Scarborough Cycles program, would like to see that change. 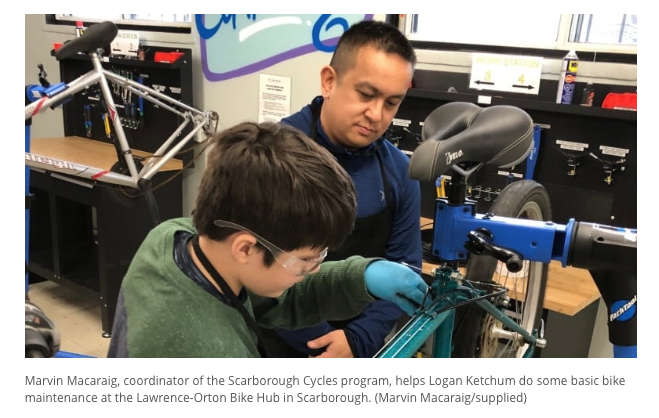 Read the full article, “Community cycling hubs get things rolling for biking advocates in Scarborough”.